It will be hard for Freddy Peralta to top the performance he put forth in his last outing. The 21-year-old struck out 13 batters over 5 2/3 innings and earned the victory in his major league debut as the Milwaukee Brewers beat the Rockies in Colorado on Sunday. That effort, along with having two starters on the disabled list, left Milwaukee with no other choice than to leave Peralta in the rotation so he’ll be on the mound Saturday when the Brewers continue their interleague series with the Twins at Target Field. Peralta was 19 when the Brewers acquired him from Seattle in exchange for first baseman Adam Lind in December 2015. He rocketed through Milwaukee’s system and posted a 2.63 ERA last season in 25 appearances (19 starts) between Class-A Carolina and Double-A Biloxi. The Brewers added him to the 40-man roster over the winter then invited him to big league spring training for the first time. Peralta opened the season with Triple-A Colorado Springs and despite the notorious hitter-friendly atmosphere there, he went 5-1 with a 3.63 ERA in seven starts before getting the call up last weekend. He’ll take the mound behind an offense that’s been on a tear of late. Milwaukee scored eight runs on 15 hits in the series opener and is averaging a shade fewer than six runs per game on its current road trip. The Brewers added first baseman Ji-Man Choi to the roster Friday after placing Ryan Braun on the disabled list with back tightness. The move paid off as Choi homered in his first at-bat Friday in Milwaukee’s 8-3 victory. 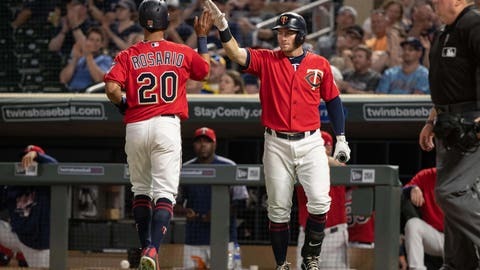 The Twins, who have lost five of their last eight games including two in a row, turn to their own young, right-handed phenom in Fernando Romero. The 23-year-old is 2-0 with a 0.54 ERA since getting called up to the big leagues May 2 and has struck out 20 batters in 16 2/3 innings. Saturday will mark Romero’s second consecutive start against a top pitching prospect. He battled Angels right-hander Shohei Ohtani in his last outing and allowed a run on four hits over five innings in the Twins’ 2-1 loss. It is the only run Romero has allowed this season. The Twins may be without first baseman Joe Mauer on Saturday. He left Friday’s game in the fifth inning with tightness in his neck and is considered day-to-day. The 35-year-old Mauer is batting .283 this season with a home run, seven doubles and 11 RBIs in 38 games.